Lohengrin used to be the most popular of Wagner’s operas, on account of its tunefulness and its high-Romantic subject matter, with its distressed maiden and knight in shining armour. To judge from CD and DVD releases, it may be retaining its old position. This new recording, ‘live’ from staged performances in Frankfurt, is a good but ultimately not a distinguished account. It’s unusually complete, though it doesn’t contain the second part of Lohengrin’s narration. The singing is on a generally fairly high level, with exceptionally good enunciation of the text from everyone (the booklet gives the full German text but no translation). Michael König makes a noble but insufficiently unworldly hero and Camilla Nylund a winning if slightly mature Elsa. Robert Hayward sings the villain Telramund straightforwardly while Michaela Schuster as his consort Ortrued manages to sound sinister, but doesn’t have the lung power for her most imposing passages, such as the invocation of the pagan gods. The two stentorian male parts, the Herald and the King, are exceptionally well sung – these parts can easily turn into monotonous bawling. The chorus and the orchestra cope well with Bertrand de Billy’s demands on them: he tends to broad tempos. The question remains of whether we need another Lohengrin in an exceptionally large field that includes many classic recordings. What does one do with a live performance of Lohengrin in which there’s nothing actually wrong, but nonetheless fades seconds after you’ve heard it? I’ve listened to this set three times–I adore the opera and always look forward to a new recording or DVD–and am bored silly by it. The Frankfurt Opern-und Museums-orchester and the Frankfurt Opera Chorus have certainly proved themselves superb in their Ring Cycle under Sebastian Weigle, with Oehms’ sound incapable of being any better balanced or honest, and the same is true here. Furthermore, much of the singing in this Lohengrin is quite good. And it’s duller than dirt. I’m not merely comparing it to the amazing, 1964 Rudolf Kempe-led version on EMI or even Semyon Bychkov’s five-year-old version from Cologne (Profil), both of which are brilliant. Listened to in a vacuum, the Frankfurt performance is somehow ineffective; Bertrand de Billy’s leadership is devoid of both excitement and tension. This opera requires a sense of wonder: Look! A white knight on a swan boat is approaching! Listen! He’s making her promise not to ask about his background! Who will win the duel? How will Ortrud convince Elsa to betray her promise? Listen! The creepy intro to Act 2 foretells evil! Yawn. Robert Hayward, a baritone previously unknown to me, is an okay Telramund, but that simply isn’t good enough. He sings intelligently and with attention to the text, but he often sounds as if he’s at the end of his vocal tether. Telramund is a tough role–he’s weak, then terrified, then fierce–but his virulent eruption in the first scene of Act 2 should stun, and here it just sounds loud. He’s best when he cowers. If you listen to Fischer-Dieskau under Kempe you’ll shudder in your boots. Michaela Schuster does everything right and she never strains–quite a feat, particularly in her two maniacal outbursts–and her quiet, insinuating singing, both to Telramund, and minutes later, to Elsa, is very effective. But the voice itself–and I realize how subjective this statement is–is not unique. Think about the competition: Astrid Varnay (with Keilberth on Decca, from 1953); Christa Ludwig (Kempe, again, singing with an audible sneer); Gwyneth Jones (under Kubelik, on DG, sounding insane). Schuster, with her lighter tone, fine singer that she is, really doesn’t have a chance. When any of the first three interrupt with “Züruck, Elsa” you feel the disruption. Maybe it’s de Billy’s leadership that turns the moment ordinary on this recording, but believe me, it’s not nearly as upsetting as usual. And now to the happy couple: What a wonderful singer is Camilla Nylund! But she sounds worldly rather than trancelike and fragile at the start, lacks the happy/nervous anticipation of say, Jessye Norman (Solti/DG), or Elisabeth Grümmer (Kempe) as she awaits her knight–and how disappointing is her high A on the word “Erlöser!”. Her firm tone and secure delivery are a joy in the big Act 2 ensembles, but she never wins our hearts. Elsa is a conundrum–penetrating but refined–and Nylund misses both by a hair. As for the Lohengrin of Michael König, just let me start with his warning to Elsa in Act 1. Both times he issues the warning as if he’s ordering from a menu: matter-of-factly, with no dire emphasis at all. He’s always audible and in tune, but his sound is generic and his way with dynamics is clumsy (“look at me, I’m singing softly!”). The Bridal Chamber Scene lacks the intimacy it absolutely requires, and his Narration, which really should do the aural equivalent of glowing in the dark, is mundane, notwithstanding every note in place, some attacked sweetly. Jess Thomas (Kempe), Placido Domingo (Solti), and others get the combination of gallantry and compassion just right; König does not. As mentioned above, I lay much blame at the feet of Bertrand de Billy. The last half hour of Act 2 seems endless and a collection of events rather than one long, tense scene; and while all of the grand moments–the duel, the big choruses, the prelude to Act 3–are well played, this set never sounds spontaneous. The sad chorus after Lohengrin’s Narrative is another straight-thinking event. If you own the Kempe, it’s all you need. This one never quite misrepresents the work, but it doesn’t quite get it, either. I found myself in Frankfurt when this performance was on, and I very nearly changed my travel plans to allow me to see it. I didn’t, but this recording, for which we should be grateful, makes me rather sorry I missed it in the flesh. The first noteworthy thing about this set is the live-ness of the acoustic. You could never mistake this for a studio recording, and that’s something that not everyone will enjoy. There is stage movement and a good deal of audience noise, for example. The benefits, however, are a very “lived-in” feeling of the score being brought to life before your ears, and the palpable sense that this is an unrepeatable event being forged in the moment. That generates excitement and stage intensity that gives the performance chemistry which I found very compelling and much more energising than distracting. The recording balance is very carefully constructed, too, favouring the orchestra ever so slightly, but without ever endangering the singers who sound clear and unobstructed all the way through. As for de Billy’s direction, it is given the space to be exciting and calculating as the score requires. The ensembles all sound good, for example, and the singing of the chorus, so important in this opera, is magnificent throughout. The soloists are all very good, too. Michael König is a four-square, dependable Lohengrin, who is fully inside the role, both in the clarity of his tone and the cleanliness of his vocal colour. He has its heroism in the first two acts and some of its vulnerability in the third. At the end of a long evening, his Grail Narration is perfectly fine rather than wonderful, but if that sounds like faint praise then his performance is certainly worth more than that and is well worth hearing. There is a pearly beauty to Camilla Nylund’s voice that makes her very well suited to the role of Elsa. She has a beautifully plaintive quality to her first appearance that makes Einsam in trüben Tagen very effective and her address to the breezes is meltingly sweet. A palpable sense of panic sets in during the last act, though, and her contributions to the final scene are very poignant. Michaela Schuster is calmly imperious as Ortrud. No histrionics here: you get the impression that this Ortrud is fully in control of events and that her composure barely ever slips. This makes her erupting rage at Entweihte Götter even more powerful. She is brilliantly calculating too, though, as you’ll hear when she plots with Telramund at the start of the second act. Listen to the contempt with which she spits out the word “held” when describing Lohengrin. Struckmann has the usual touch of gravel to his voice, but that helps to set his authoritative King aside from the more vigorous but more insidious Telramund of Robert Hayward. So all is pretty good, here. This isn’t a first-choice Lohengrin: that privilege still goes to Kempe with Abbado and Solti nipping at his heels. Nor is it one for newcomers, despite its many virtues, principally because, as I am told is their habit, Oehms’ booklet includes no English text except a synopsis and cast biographies. While you get the full libretto it is in German only. So this is a Lohengrin to go to once you know the opera, but once you do so I think you’ll find a lot in it to enjoy. This is the first of Oehms’ Frankfurt Opera recordings that I have come across and I enjoyed this one so much that I shall certainly look out for more in the future. Die Oper Frankfurt und das Label Oehms Classics sind seit einigen Jahren daran, die Opern Richard Wagners in Live-Einspielungen herauszubringen. Das jüngste Kind in dieser Reihe ist «Lohengrin», eine Produktion vom Frühjahr 2013 in der Regie von Jens-Daniel Herzog. Wiederum musizieren der Chor der Oper Frankfurt und das Frankfurter Opern- und Museumsorchester, erstmals unter der Leitung von Bertrand de Billy. Gleich in der Ouvertüre spannt der Dirigent einen unwiderstehlichen Bogen von den ätherischen Streicherklängen des Beginns bis zum prunkvollen Höhepunkt und wieder zurück. Prominent besetzt sind die Hauptrollen. 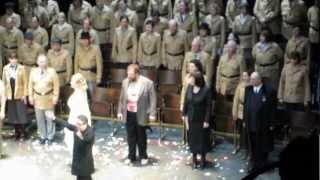 Der Lohengrin von Michael König kommt als strahlender Tenor daher, durchaus heldenhaft, aber ohne Gewalt in der Stimme. Die Elsa von Camilla Nylund beherrscht sämtliche Gefühlsregister, was besonders im grossen Duett des Liebespaares im dritten Akt hörbar wird. Einen starken Kontrast zum Hauptpaar bildet das intrigierende Gespann Ortrud/Telramund. Der Engländer Robert Hayward gibt Lohengrins Widersacher mit leicht gepresster Stimme als rachsüchtigen Machtmenschen. Und die Ortrud von Michaela Schuster spinnt ihre Fäden mit Körper und Verführungsgewalt in der Stimme. Ce nouveau Lohengrin venu des rives du Main témoigne de l’engouement des Francfortois pour les opéras de Richard Wagner (lire ici). La distribution frappe par son homogénéité. Certes, Michael König est un Lohengrin court en plumes, surtout en regard des grands titulaires du rôle – passés (Lauritz Melchior, Sándor Kónya, Jess Thomas, René Kollo, Gösta Winbergh…) ou présents (à commencer par Jonas Kaufmann et Klaus Florian Vogt). Mais malgré un timbre un peu touffu, le ténor allemand ne démérite pas et maîtrise sa partie sans (trop) tirer sur les aigus – ce qui est en soi une prouesse. Dans la lignée de ses interprétations «tout terrain», Camilla Nylund réussit également son Elsa, notamment dans le lyrisme de l’intimité du dernier acte – le duo avec Michael König fonctionnant bien. Michaela Schuster aborde Ortrud sans hystérie, avec une objectivité dépourvue de venin – un peu pâlotte parfois (surtout à la fin du deuxième acte). Cependant, la voix en impose et le souci de chanter chaque note du rôle – y compris au troisième acte – n’est pas si fréquent. On regrette, en revanche, que l’intonation du Telramund de Robert Hayward soit aussi douteuse, et parfois franchement fausse – avec un cheveu sur la langue et quelques poils sur le timbre (qui grésille laidement). Sans l’épaisseur nécessaire pour marquer de son empreinte le début du deuxième acte, où il s’essouffle assez vite (mais ne s’effondre pas). Falk Struckmann est un Heinrich à la stature bien légère, presque lyrique. Il apporte toutefois une certaine lumière au rôle, qui change des formats XXL. Dommage que le timbre manque de consistance. Quant à Daniel Schmutzhard, il livre un héraut convaincant sinon prometteur. Dans la fosse, on salue la clarté et la franchise de la direction, ainsi que le brillant des cuivres et, plus encore, la souplesse des cordes de l’Orchestre de l’Opéra de Francfort. Souplesse des chœurs aussi, qui portent la quatrième scène du deuxième acte vers des sommets de douceur poétique (la fin de l’acte restant plus ordinaire). Bertrand de Billy flirte parfois avec le sentimentalisme (dans le dernier acte notamment), mais il parvient à toucher par la chaleur de sa battue. Un Lohengrin de fort bonne tenue – à l’image de la prise de son (restituant le live sans ses bruits parasites) –, qui ne bouleverse en rien la discographie de cet opéra de Wagner.